I had a perfectly good post ready for you on guilt, but decided against it. That can wait. Today's stories are just too rich. I'm working my remote control, looking for something to watch in the bewitching hour, dinnertime. Before the dishes are done I'm scrounging around in the freezer for something, anything, truly bad for me (we call this dessert). Success, I take a sliver of cheesecake to my nest and flip channels only to find a new one: Can Israel Win the PR War? This looks good, but of course, when something looks good, I am not a subscriber. I determine to call RCN tomorrow, won't make financial decisions under the influence of milk products. Wait a minute? Why RCN? Doesn't everyone subscribe to Comcast? Crazy coincidence, but I had recently cancelled Comcast, made the switch only a few weeks ago. Comcast seemed to be bleeding me. But the real reason for the switch? The customer service person at RCN seemed so nice. Interrupting my search for something mine-numbing, the concerned folks at Comcast happen to call me just then. "But why did you really switch? We really want to know. Why?" I hang up at the second question, I get it. My Spidey sense smells a predator. I find Jane Eyre on Netflix (perfect), a service RCN includes with the package. Here's a link to that viral video. We hear: "If we don't know why our customers are leaving, how are we supposed to make it a better experience for you next time?" Not our problem, Comcast. So it is likely, since others are experiencing the same telephone harassment, that Comcast reps are trained to push the product hard, that this is a systemic sales approach, no different from any retailer offering you a dozen incentives to buy a product. The guilting the hard sell, could be on its way out. The question for me becomes: How does the rep feel, pushing the product to the degree that he is harassing the customer? Will I be seeing him in therapy? Yes, as a matter of fact, yes. Thanks so much, Comcast. As a marvelous actress and movie icon, Sandra Bullock has many fans, yours truly among them (nothing like 28 Days for those of you trying to stay sober). So it is no surprise that she has her stalkers, what Dr. Phil calls erotophiles (or did I hear that wrong), people who fantasize about stars and become delusional, come to believe they have a relationship with them and the right to violate social boundaries, like doors and windows. Joshua Corbett did that, broke into Ms. Bullock's home to continue an imaginary relationship. He apologized, but as Dr. Phil suggests, it is likely he won't stop, hat he is incurable. He could be a psychopath, in that case, and we're going to be discussing being a psychopath in the next post, the one on guilt. Because psychopaths don't suffer guilt like the rest of humanity, neurotic humanity. Just one theory why. Is every war really a battle of the media, all about image, public relations? This one is, above all. It is not about children being kidnapped and killed, or some wise politician, someone like Solomon the Wise, the Jewish king of Israel, no, make that Palestine, over two thousand years ago, would offer a a better solution. Solomon, if you recall, when two women came to him arguing about possession of the one surviving infant (the other had died during the night), suggested that they cut the surviving baby in half. The true mother cried, "No! Don't! She can have it!" Solomon gave the baby to the one who cared, the proper mother. Were he here today, Solomon might have suggested an alternative to missile launches (the Hamas response to the death of a Palestinian child) or an invasion in Gaza, the Israeli response to the missiles. The order of events: Hamas operatives in Hebron, near a Jewish school, kill three Jewish teens. Jewish renegades retaliate, kill one Palestinian youth. Solomon might say that to make it square, Hamas should kill three Arab kids, Israel should kill another Jewish child. The score, four to four. Even. No? A bad idea? Surely it is, because this isn't about children. It is about making Israel look aggressive and evil to the International community. The war is for sympathy. 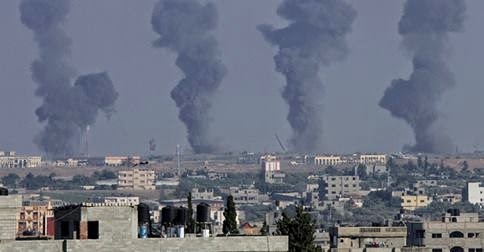 Having an excuse to power off more Syrian, Russian, or Iranian missiles, Hamas pounds Israel hoping for a response in order to accuse Israel of genocide, another Holocaust. The international community doesn't know who to believe, for calls of genocide are to be taken seriously. It sounds strange, Israelis shouting to Palestinians to leave their homes, they must be bombed to destroy arms and missiles, route out Hamas. Homeless, they are hapless victims. It is a terrible situation and it looks, on the surface, as if Israel is made of heartless leadership, oppressors beating on a defenseless people. The prime minister of Israel, Benjamin Netanyahu (I think Harvard educated, not that it matters, but his English is impeccable) explains the problem. Hamas, a terrorist organization, hides in Palestinian homes. Missiles are stored in tunnels that ordinarily would be used as bomb shelters for people in times of war. Netanyahu eloquently describes the situation: Israel uses missiles to defend civilians, Hamas uses civilians to defend missiles. It has gone viral. The story is worth reading in its entirety. My experience with social media (and I have about ten FaceBook friends, so you know I'm well-versed), is that Israel is doing a nice PR job, although losing, as usual. 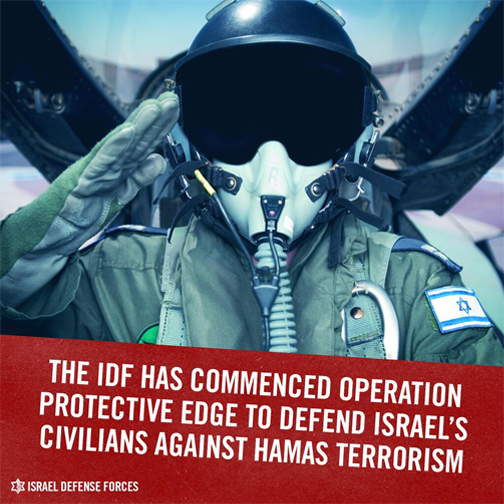 Groups such as United with Israel, Stand with Us, the IDF blog (Israel Defense Force) and the World Zionist Organization help people like me feel connected with what goes on behind the scenes. The Jerusalem Post, the Anglo newspaper, is up to date, and we have eloquent Arab Zionists like Mohammad Zoabi, shatters myths with his public FaceBook page. What has this to do with therapy? Well, those of us American Jews who wish we lived in Israel, who feel emotionally, spiritually, nationally, genetically, phenotypically, archaeologically, and all kinds of other ally-connected words that connect us to the holy land, feel guilty that there isn't much we can do from afar, aside from sending money for bomb shelters for either side. We would like to support the country, Jew and Arab alike, and we certainly don't like that the Arabs who are called Palestinians are victims of terrorist organizations. But we hear stories that they teach their children to hate Jews, any Jews, and this is upsetting, too, tickles our catastrophic fears of gang warfare, many Arab countries coming down upon Israel, and nukes from Iran. So an Israeli public relations success essentially means, work the guilt. Disseminate the other side. Write. Post on FaceBook. Tweet. We're good at all that. Oh, let me ramble on just a little more. Some people don't even know where Gaza is, what it means, why the Palestinians are even there! Israel traded this fertile coastal territory, Gaza, ten years ago, for peace. Land for peace was a political solution to the terrorist problem. Jews left their homes, synagogues, their irrigated fields and farms, profitable kibbutzim, handed it all off to the Palestinians relocated to tents in Israel proper. I have pictures of my cousins, prior to what was called disengagement, smiling teenagers working in Gush Katif, a kibbutz. I remember touring the Gush proudly, before Ariel Sharon handed it off, determined it a good trade. Don't let it die, the Jewish farmers begged the Palestinians in 2004. Land for Peace. You take the land, we'll take the peace. So in return, ten years later, from their new homes, these residents are subdued or influenced, perhaps even side with Hamas, the bully in their midst, and send rockets as thanks. No pity from the Western press for Israeli farmers, their fields blown to bits by these missiles, their children running for shelter. Loss of Jewish life has begun. A man bringing sweets to soldiers fell this week. And all the while, as the anti-Israel press speaks of a holocaust. There are more good links, good videos. Try Israel in My Heart, or Dennis Prager's easy on the eyes Middle East Problem. Detractors call Prager's propaganda, but it is all true if you know Jewish history. And here's a nice one about bringing comedy to the troops. Because war isn't supposed to be a drag, constantly. The Western media doesn't tell you much about a 5000 year Jewish presence in Israel, three Jewish states, the many kingdoms, the constant battle against extinction. Nothing about the constant presence of Jews in a land they irrigated, farmed, and modernized, on their own. Nothing about the Palestinian Liberation Organization's constitution that vows to send their cousins packing, driven to the sea, sans boats. The Palestinians are the vulnerable population in Gaza. But the Jews are vulnerable, too. Always have been, although we like to think less so. Young men with small children, like my nephews, will be called up for service to put an end to the missile launches. And yes, people will die, will lose homes, are losing them as you read this. And for what? Because there is no amount of land that will buy peace in Israel, unless it is all of the land. Not happening. I have a ticket. Just a visit to see family, to recharge my battery, and no, have no intention of not getting on that plane. I watched as neighbors packed boxes into a huge van, dozens of boxes, their entire lives lifted by skinny muscular guys into a truck. They are moving to Israel this week. There will be, contrary to the news you hear on the radio, an airport, a place to land, when they get there.